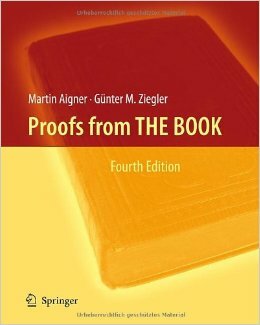 April’s Book of the Month is Proofs From The Book by Martin Aigner and Günter Zeigler. Paul Erdös liked to talk about The Book, in which God maintains the perfect proofs for mathematical theorems, following the dictum of G. H. Hardy that there is no permanent place for ugly mathematics. Erdös also said that you need not believe in God but, as a mathematician, you should believe in The Book. A few years ago, we suggested to him to write up a first (and very modest) approximation to The Book. He was enthusiastic about the idea and, characteristically, went to work immediately, filling page after page with his suggestions. Our book was supposed to appear in March 1998 as a present to Erdös’ 85th birthday. With Paul’s unfortunate death in the summer of 1997, he is not listed as a co-author. Instead this book is dedicated to his memory. We have no definition or characterization of what constitutes a proof from The Book: all we offer here is the examples that we have selected, hoping that our readers will share our enthusiasm about brilliant ideas, clever insights and wonderful observations.